Tickets £5.00, available over the phone on 01799 524 552 or in-store. Join us for an evening with author Simon Edge as he discusses his new novel ‘The Hurtle of Hell’. When gay, pleasure-seeking Stefano Cartwright is almost killed by a wave on a holiday beach, his journey up a tunnel of light convinces him that God exists after all, and he may need to change his ways if he is not to end up in hell. When God happens to look down his celestial telescope and see Stefano, he is obliged to pay unprecedented attention to an obscure planet in a distant galaxy, and ends up on the greatest adventure of his multi-eon existence. 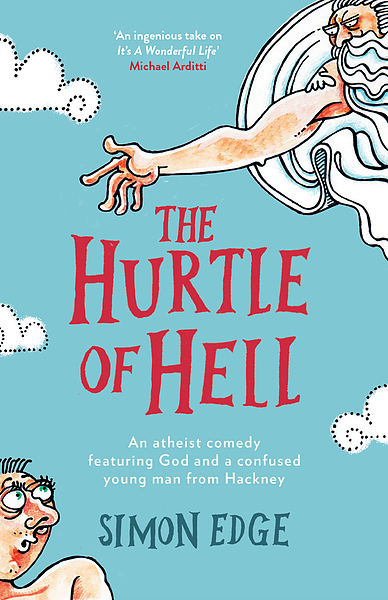 The Hurtle of Hell combines a tender, human story of rejection and reconnection with an utterly original and often very funny theological thought-experiment, in an entrancing fable that is both mischievous and big-hearted.